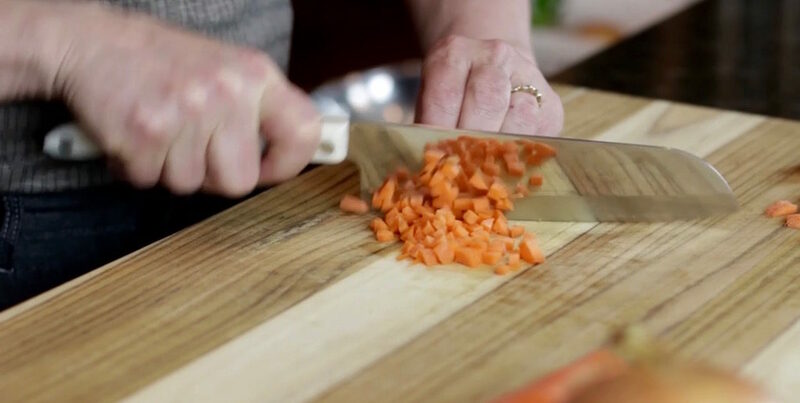 Many recipes call for dicing vegetables. 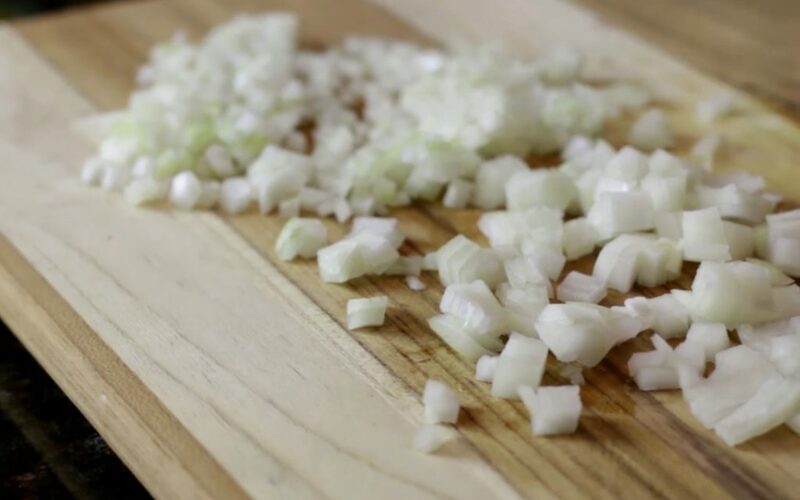 Any slow cooke sauce or soup starts with mirepoix, a combination of diced onions, celery, and carrots (ratio 2:1:1) as the foundation of the flavor base.Let us show you how to dice vegetables. Common sizes are ¼-inch and ½-inch dice. 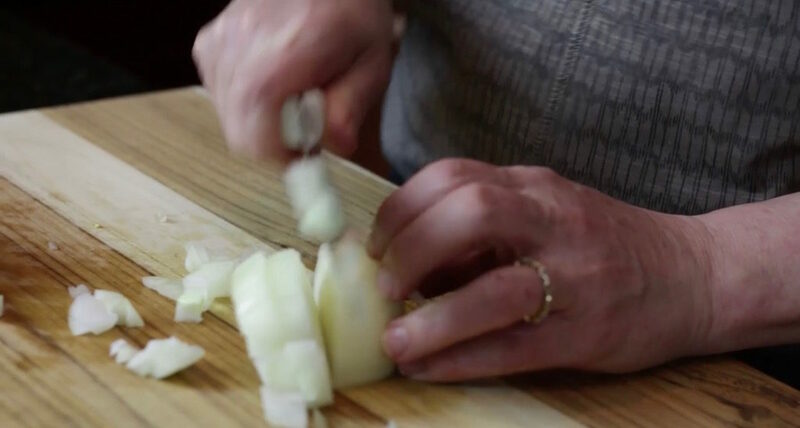 Take the onion and slice a thin piece off the root end to get rid of the dirt and dried roots. Cut the top off, stand the onion on the flat end and slice in half. Remove the skin and place the cut side flat on the cutting board. 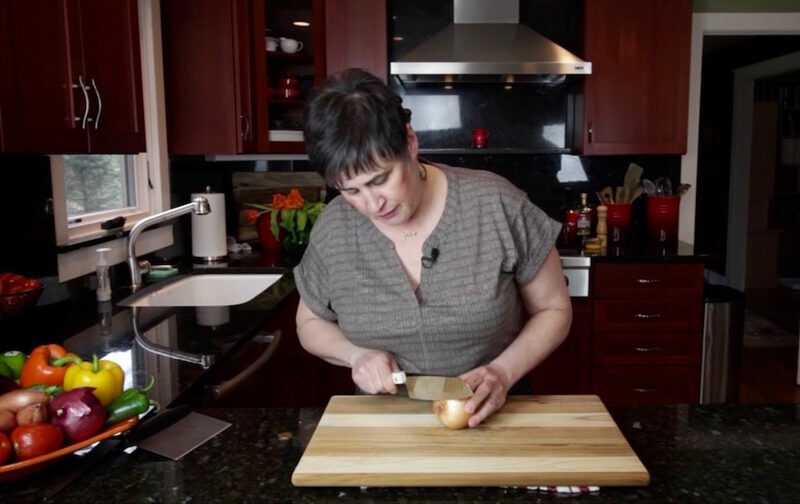 Place the heel of your chef’s knife against the top of the onion ¼- or ½-inch from the board and pull the knife back almost to the root end. Leave this small amount uncut to keep the onion intact. Repeat until you get to the top of the onion. Turn the onion toward you with the root at the back. 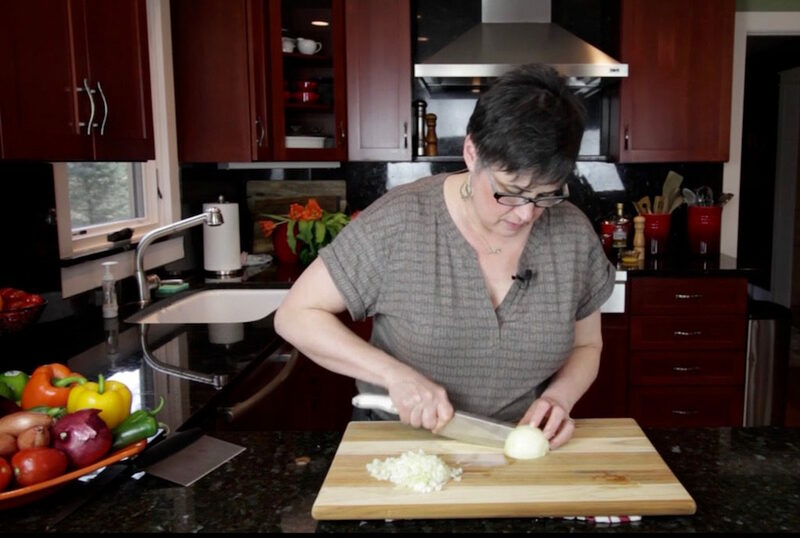 Make the same size slits across the onion without cutting through the root. 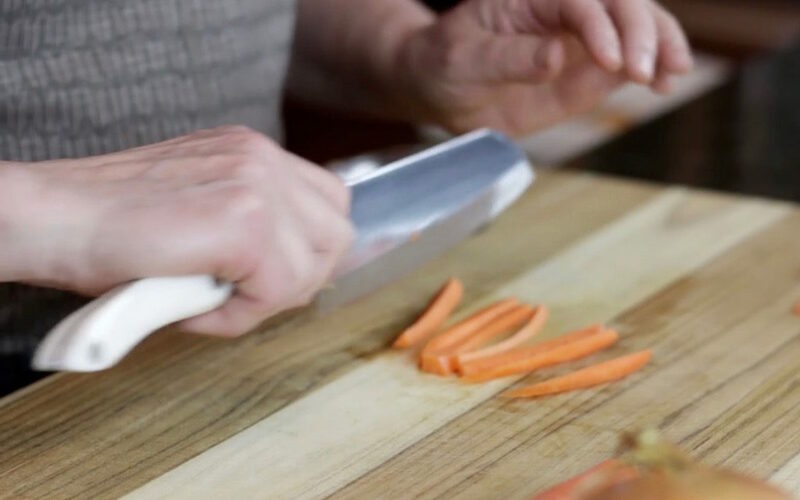 Be sure to tuck your fingers under yourknuckles and keep your knuckles forward when slicing. The side of the knife runs into knuckles and your fingers are safely tucked away from the sharp blade. 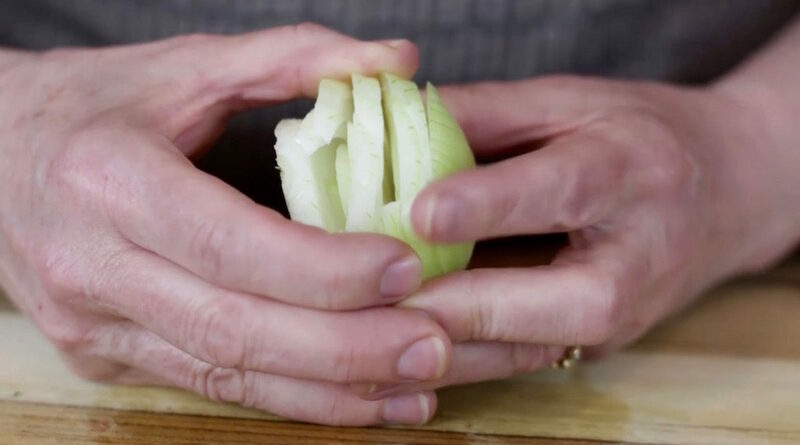 Turn the onion back to it’s original position make same size slices. Here’s a shot of a 1/4-inch dice (background) and 1/2-inch dice (front). 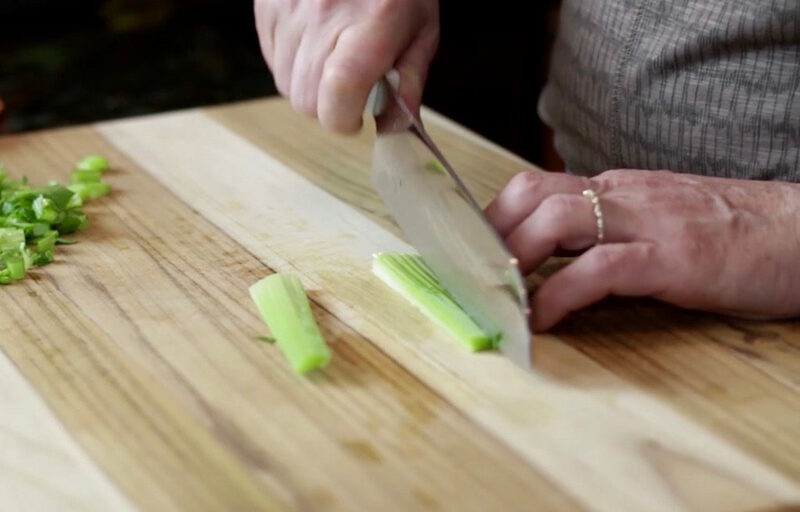 Take a celery stalk and cut in half if very long for easier handling. Slice the stalk in half lengthwise and each half into 1/2-inch sticks or 1/4-inch sticks. Turn the stalks and slice into a 1/2-inch or 1/4-inch dice. Carrots have an odd shape, very large at the top tapering to a narrow end. Depending on the length and diameter of the carrot cut in half or in thirds. Then cut each piece in half lengthwise. Place the flat side down and cut into 1/2-inch or 1/4-inch slices. Now cut each slice into 1/2-inch or 1/4-inch pieces. Lay these sticks side by side and cut across into a 1/2-inch or 1/4-inch dice. Watch the How to Dice video here.